You are a trader at heart. You have your finger on the constant pulse of the stock market. The last thing you want, however, is to be stuck at your computer all day watching the ticker, reading the news, and charting your favorite stock buys. 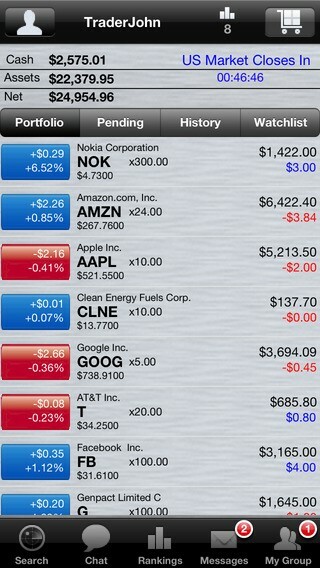 Fortunately, some of the hottest apps available today allow you to stay in tune with the market, all while on the go. Jstock is one of the free stock trading apps available for the average Joe. What makes it so great is that it is user-friendly and provides real-time stock quotes, charts, market news, and company data. The bonus is that all of the data is organized in an easy-to-read manner. 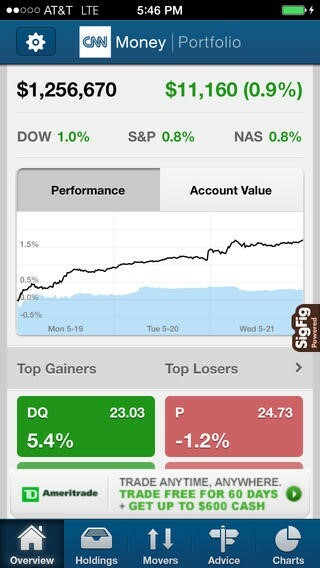 With access to 26 stock markets and a desktop version that syncs with the mobile version, you have all of the info you need at your fingertips at your desk and on the go. You can upgrade to the paid version to go ad-free and to receive additional tools for charting. If you are new to trading and not quite ready to dabble in the stock market with your hard-earned money, then Stock Market Simulator Plus is for you. The Android app allows you to create virtual portfolios so you can test your skills before you have real skin in the game. The app provides you with all of the tools and information you need to make educated trading decisions and to make virtual stock trades to see how your portfolio choices play out. 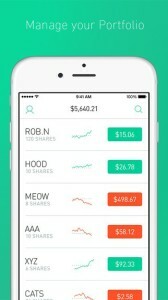 Launched as an app specifically for millennials, the Robinhood app offers free trades. 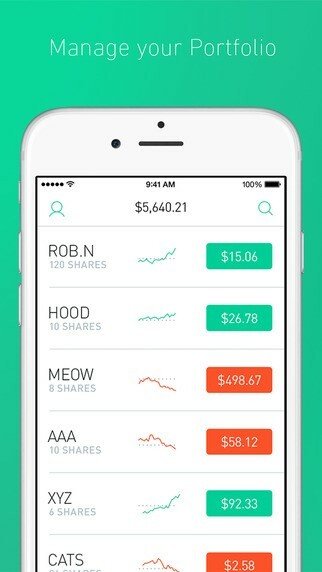 While most stock accounts charge a fee for trading, the Robinhood app allows account holders to trade without paying one red cent for each trade. While the app offers stock news, charts, and company information, like most standard apps, what sets this app apart is the price to play. If you have a reliable network, you can check the stock market on your iPhone 6 from anywhere, at any time and never have to worry about missing a trade opportunity again. While you can buy and sell using the Scutify app, that’s not what makes it stand apart from the trading app crowd. Scutify is the Facebook of trading. It is a community of investors and fellow stock traders that you can join to communicate, share information, gain insights, and ask for advice. The app also acts as an aggregator, so it pulls social media posts about the market and stocks from other social media networks. This way you can read what’s happing all in one spot. Stockwits is to traders what Twitter is to social media addicts. Traders can receive up-to-date and real-time information on stocks and portfolios from their fellow traders. 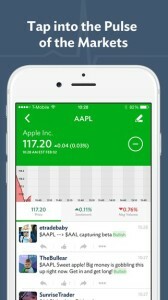 App users can also post short snippets of information to update their social media network on company news and stock tips. The truly unique part about Stockwits is that it shows an indicator as to whether or not an investor is bullish or bearish on any particular stock. If you have your portfolio accounts spread out at different firms, you can bring them all together for analysis using the CNN Money Portfolio for Stocks. You can import your different accounts from various brokerage firms, a feature that’s available for most of the major firms. The app helps you to analyze the risk and performance of your overall portfolio and puts the data into visually appealing and easy-to-read charts to help you gain insight into your asset situation. The best part about the app is that it analyzes your trading behavior and provides personal advice as to what you should do with your portfolios. You do not have to sit in front of your computer all day to manage your portfolio, trade stocks, or stay up-to-date on what is happening in the market. 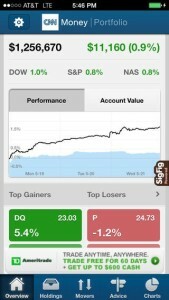 Using a combination of apps on your smartphone, you can manage your portfolio continuously and make trades on the go.